Outside of Uganda’s capital Kampala, where the eastern border of the city blurs into messy suburban sprawl, a rocky hill has offered 25 years of refuge to 10,000 of the people who fled Joseph Kony’s rebel war in Acholiland, about 400 kilometers to the North. 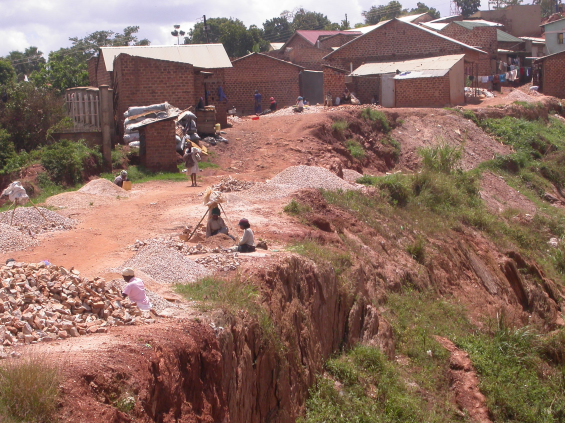 Known locally as the Acholi Quarter, Kireka hill is also home to one of the city’s largest stone quarries, which offers low paid and back-breaking employment to hundreds of traumatized hillside residents. trying to figure out how to scrape together enough resources to move their families home. they have the money to move or not, it’s now really time to go home. together, they save small weekly amounts of money together, and they support each other through life’s challenges. More than anything these days, the LiA ladies plan together for the very complex and expensive challenge of rebuilding their destroyed homes and farms in the empty countryside 400 km away, so they can finally move their families back. as a group to rebuilding their post-war community and culture in the North. mothers among them) will need a place to re-settle more permanently, and would like to develop the Family Transition Center into a longer term center that serves the surrounding community. to learning how to enjoy and be effective in an agricultural lifestyle, the children will need guidance and social support in adapting to the traditional Acholi culture that they have missed out on growing up in urban and IDP camp conditions. local community education and transition support hub. innovation from around the world to share knowledge with the local community on nurturing co-designed community driven solutions to local challenges. Nothing can begin to happen, however, without first buying land. The tipping point for this campaign is set at $4,000, which will at enable the immediate purchase of 3-5 acres of land to build the Family Transition Center on. to share, and establish a small income generating project at the center, as detailed below. $15,000 budget the women have developed includes a transport fund which reflects that ideal scenario. could be forced to leave their current homes at any moment. There have been cases in Uganda where bulldozers have arrived unannounced to demolish whole neighborhoods or IDP camps from one day to the next. 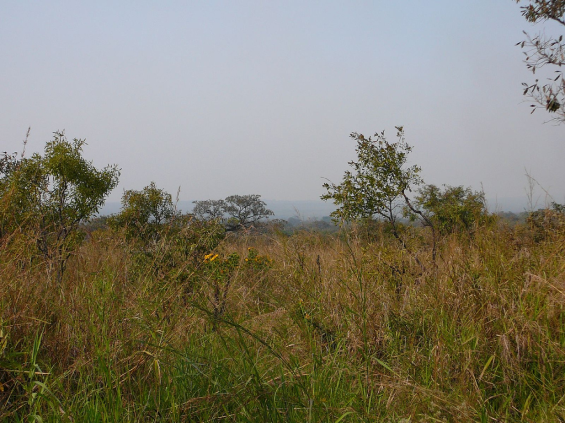 Northern Uganda was completely cleared of human habitation for almost 20 years, so returning now means starting from really nothing. If they don't raise enough funds to build lodging on the land they buy, the women will have to start out living in tents. are adequate schools there, and the area is central (within 1.5 hours) to 22 of the 35 members' former homes. to help develop and run the center over the long term. - Lodging: The plan is to initially construct two large communal huts (bricks with grass thatching). The women who plan to live at the center for longer periods will need to build their own homes there from their own funds. - A team transport fund will ensure that every woman involved can make the 400k journey to the north twice between August and December, to participate in the team work needed to prepare the center and the first 22 homesteads in the nearby region. work teams to be able to eat during this period, as well as seeds for planting some kitchen gardens and cash crops on the Center's land. enable them to buy 4 oxen and 2 plows to share. provide for an initial 15 pigs. the skills, knowledge and experience they've gained in the city, to the newly reforming communities they were forced to leave 2 decades ago. term Family Transition Center plan is hopeful, in spite of the fear that surrounds their current situation. They are ready to work very hard to help each other and to give back what they can in their local context. They just need a little help. That's where you come in. 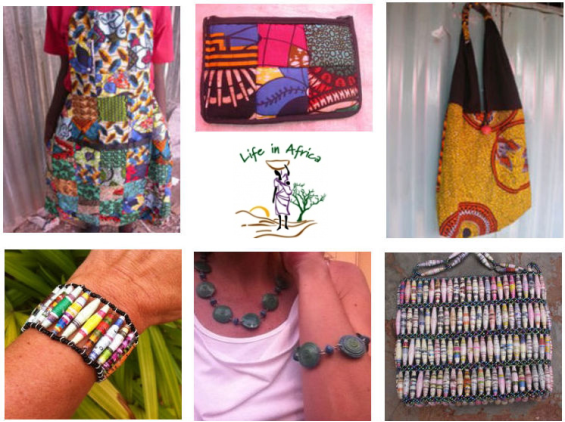 The women of Life in Africa produce lovely textile and jewelry products which they are offering as rewards to those who contribute financially to helping them make the Family Transition Center a reality. 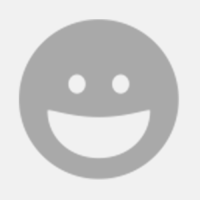 Scroll up to see which rewards are included at each level of support. Please contribute what you can today, and kindly share this campaign as widely as possible. These wonderful women don't deserve to be left homeless again. 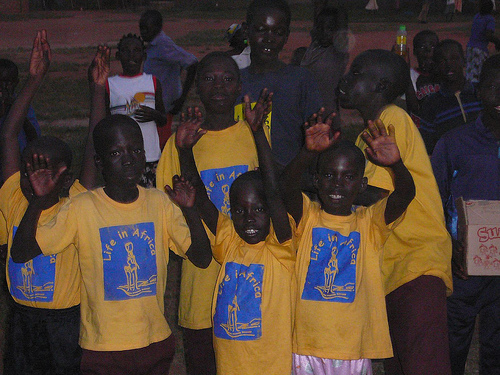 A thank you email from the Life in Africa team in Uganda. 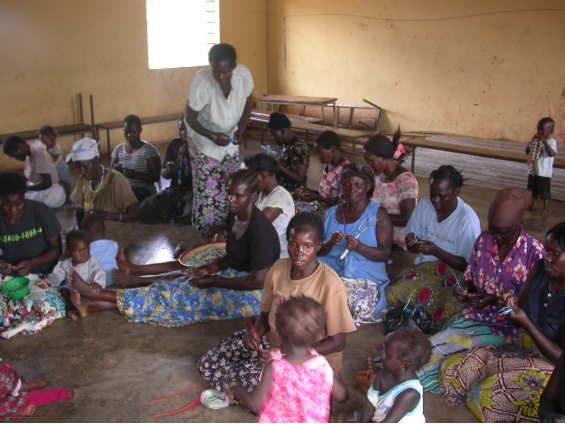 A thank you email from Life in Africa in Uganda, plus thank you photo of the Life in Africa members. All of the above, plus a postcard sent to you from Uganda. All of the above, plus a multicolored bangle bracelet made from recycled paper beads. All of the above, plus a green spiral bead necklace made from recycled paper. All of the above, plus a matching green spiral paper bead bracelet. All of the above, plus a coin purse made from a patchwork of African fabrics. All of the above, plus an apron made from a patchwork of African fabrics.